Will Dwayne Johnson Play LOBO in the Warner Bros. Adaptation of the DC Comic? Last week, a random Twitter user mentioned her desire to see The Rock as a DC superhero. Dwayne Johnson, forever in touch with his fans, tweeted in response, “Funny U say that…” That obviously sparked fervent speculation. Bleeding Cool followed up with an interesting possibility: the antihero biker Lobo. Bleeding Cool admits their source is untested, one who purportedly overheard Johnson boasting at a party that he will play Lobo. But the rumor is a good fit. There is a Lobo adaptation in development. Brad Peyton, the director of Johnson’s last movie Journey 2: The Center of the Earth, is steering the ship. And no actor really has that Lobo physique other than The Rock. So all the pieces fit—we’re just missing the important ones that spell “O-f-f-i-c-i-a-l” across the top. We’ll put a pin in this for now. 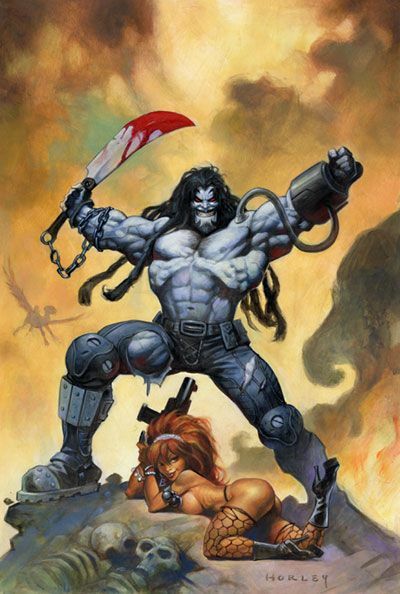 In the meantime, hit the jump for background on Lobo. He sounds delightful. I assume this will be one of the few R-rated comic book movies, and thus an exciting choice for Mr. Johnson if it’s meant to be.